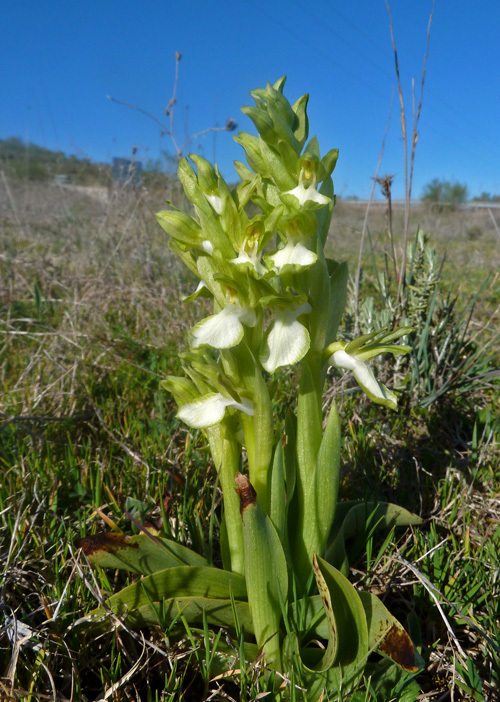 In a contribution for the Journal of European Orchids (Journal Europäischer Orchideen, vol. 50, 2-4, 2018, p. 221-226), Leslie Lewis presents an overview of the hypochrome forms of Neottia nidus-avis and new findings in England. 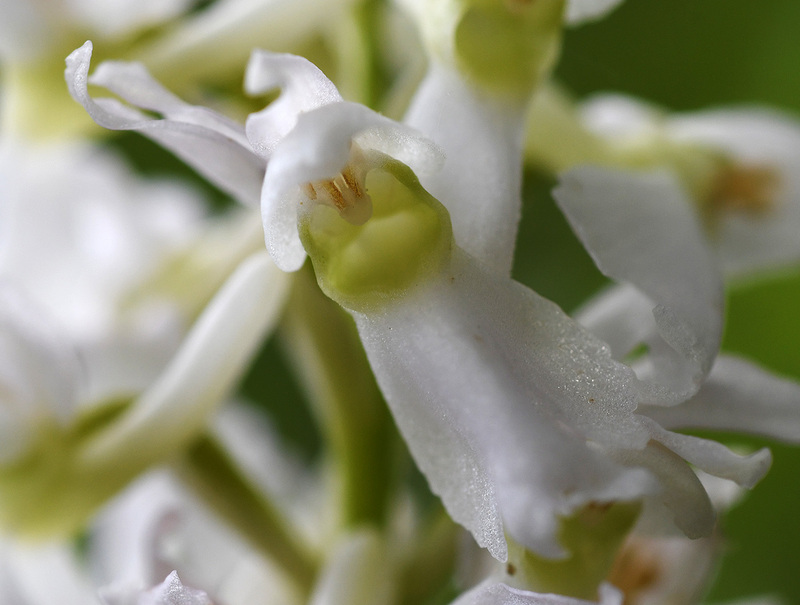 In the introduction, she explains that these orchids have colour pigments – chlorophyll and carotinoids. However, colour variants are also occasionally found, the author writes. a spontaneous mutation of a hybrid affecting the production of color pigments. Griebl sees a higher probability for the second case. 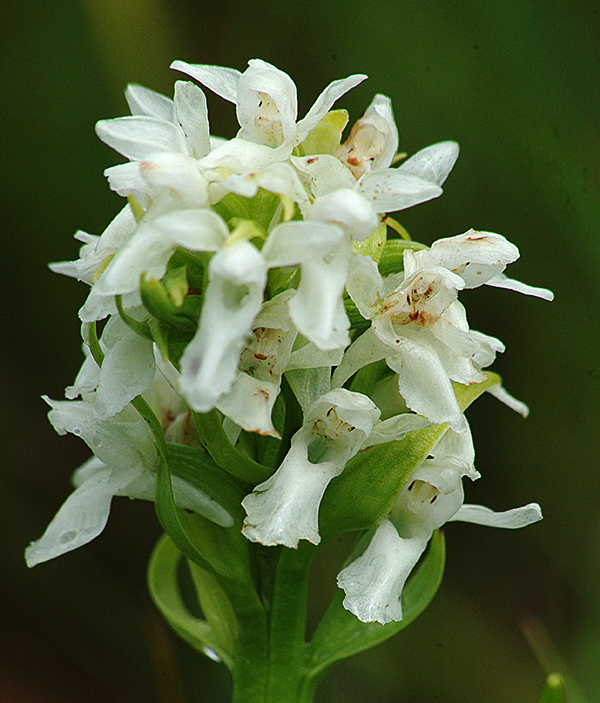 This is supported by the fact that there have been no reports of such an Albiflora hybrid in other regions with color varieties of Nigritella rhellicani and white-flowered Gymnadenia conopsea, for example on the Seiser Alm in Southern Tirol – though these Suaveolens hybrids can be regularly seen there. 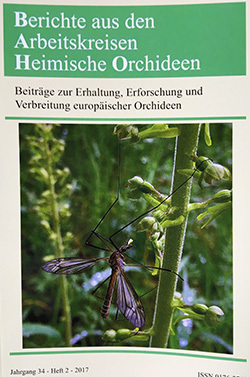 This hypothesis has been formulated by Hannes Paulus in a contribution for the latest edition of the Journal Europäischer Orchideen (Hannes F. Paulus: Zur Bestäubungsbiologie der Gattung Ophrys in Nordspanien: Freilandstudien an Ophrys aveyronensis, O. subinsectifera, O. riojana, O. vasconica und O. forestieri. J. Eur. Orchideen. 49 (3-4): 427-471). In this article the author studies both populations of Ophrys aveyronensis in Southern France and Northern Spain – the last one termed as Ophrys aveyronensis subsp. vitorica. According to Paulus it is just one species, because both are pollinated by the bee Andrena hattorfiana. Paulus points to the fact that this bee is specialised on the widow-flower (Knautia). The pink inflorescence of this plant has the same colour as the perigone, i.e. the sepals and petals, of Ophrys aveyronensis. 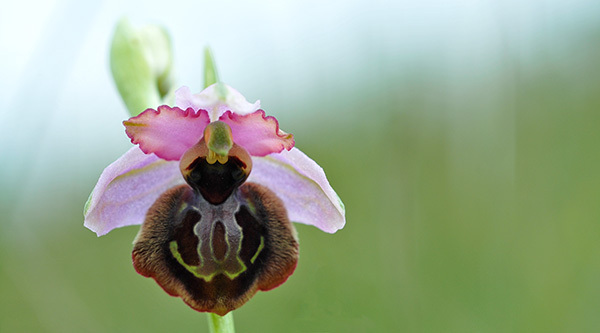 The expert of Ophrys is stating: It can be expected that this is not just a mere chance but an adaptation to the main nourishing plant of the pollinator. Knautia shows at the same time more deeply pink flowers as flowers tending to white. This evidence is confirming the approach to also look for other plants when we search for reasons why albiflora forms of different orchid species are more often in certain places. 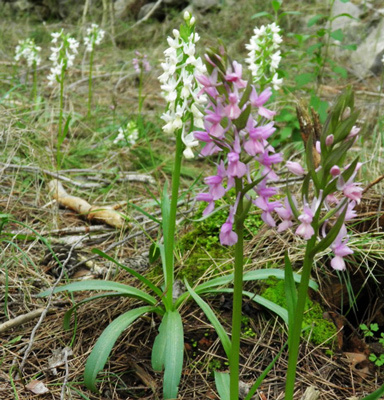 The leaves of these plants are unspotted, while the violet-flowered Orchis mascula often have intense spots. Nearby, Orchis purpurea was beginning to flower. 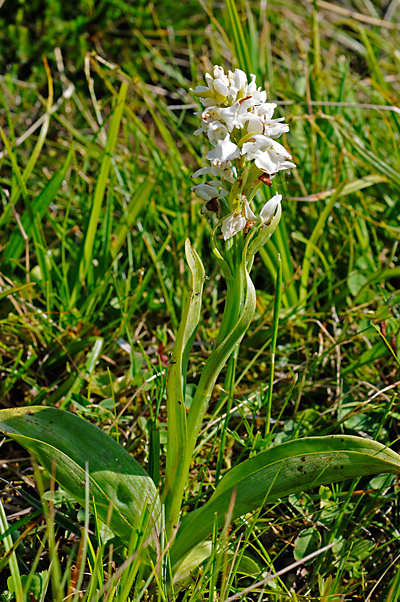 The third orchid species on this meadow in the “Schdänerer Weiberch”, as it is called in the Hesse idiom at the beginning of the path, is Himantoglossum hircinum. 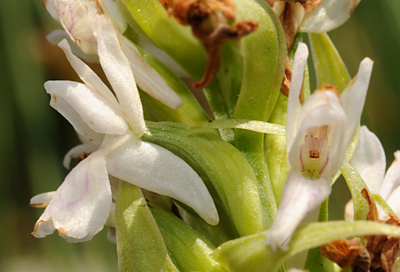 In May, the lizard orchid is just beginning to develop its inflorescence. A bit further on the path, at the edge of a small forest, there was another albiflora form of Orchis mascula, also without any violet color in the flower, but with a marked green stigmatic lobe. The green hue is also preserved in the spur. 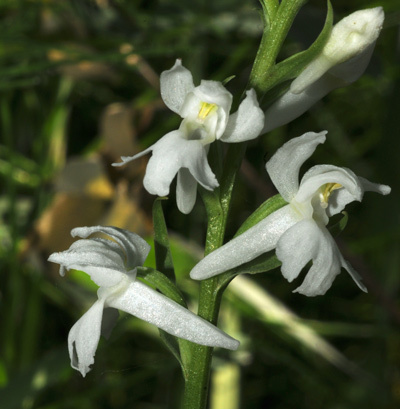 Before the end of the year I received special finding reports from Lithuania: Bernd Gliwa has found a white-flowered Dactylorhiza traunsteineri, only once in 2006. The location is in a lime marsh between Kaunas and Šiauliai. 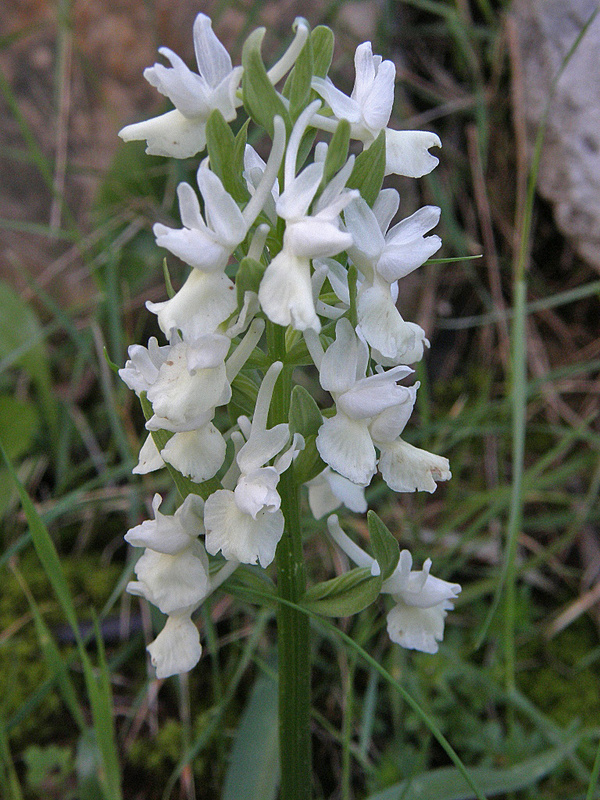 It’s quite remarkable that this Dactylorhiza species is quite rare to see with white-flowered forms. 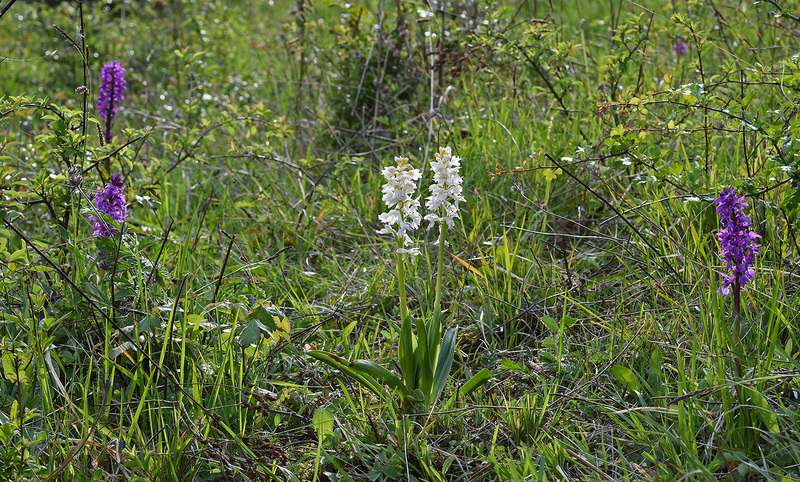 In this nature reserve he has also photographed this Dactylorhiza incarnata. In this area there are also Dactylorhiza incarnata subsp. ochroleuca (with W. Eccarius, Die Orchideengattung Dactylorhiza, 2016 it’s again a species of its own, D. ochroleuca), Dactylorhiza incarnata subsp. cruenta and Dactylorhiza majalis subsp. baltica. Bernd Gliwa has also studied the dragonflies of Lithuania and just published a monograph about them: Lietuvos laumžirgiai. Why are Ophrys flowers with a defect in pigment production yellowish-greenish and not white as it’s the case with Orchis, Dactylorhiza or other genera? I’ve tried to give an answer to this question at the orchids conference in Sundheim (Germany), in a lecture titled The Ophrys flower – more than an invitation to pseudo copulation. My assumption: The lips of all Ophrys flowers are green – but in most cases we can’t see it, because the chlorophyll in the lips is covered by anthocyanins. Only if the production of anthocyanins is disturbed, the chlorophyll in the Ophrys lip is visible, often together with yellow pigments. 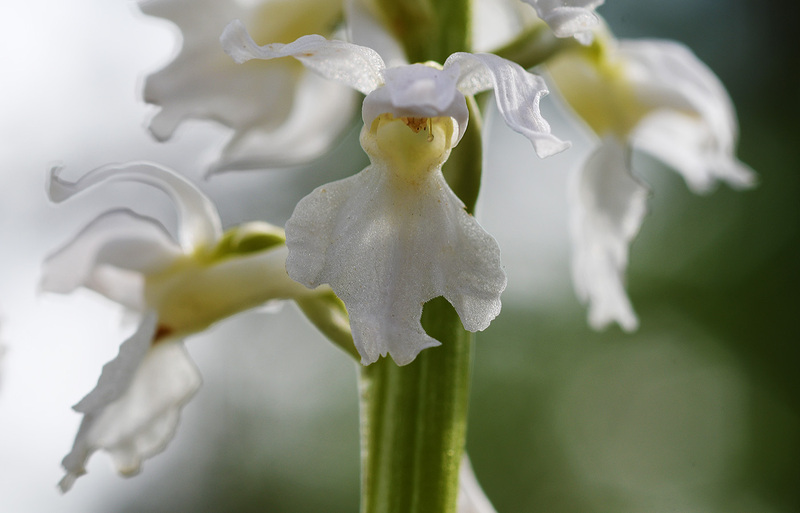 Only the marking of the labellum is free of those pigments, it appears in the case of a defect in Anthocyanin production as white. But even in the lower segments of the bluishly shining marking of Ophrys speculum researchers have showed the existence of chloroplasts, of cell plastids with chlorophyll. The bluish color comes from the vacuoles of the epidermis which are filled with cyanidin pigments, while the brown rest of the labellum in addition contains delphinidin, quercetin and anthocyanin pigments. The Ophrys forms without anthocyanins cannot be termed as white-flowered or albiflora. It makes more sense to call them hypochromic in the meaning of a underdeveloped production of color pigments. Those forms have been found with more than 20 Ophrys species. 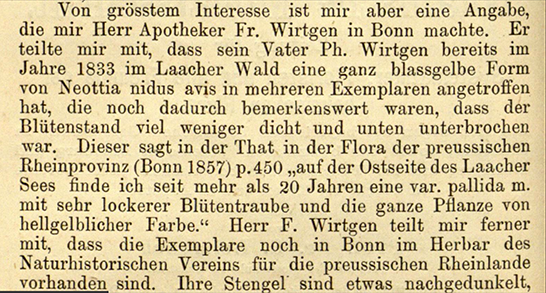 Near the Swiss town of Basel there is a whole population of Ophrys apifera plants without anthocyanins in the labellum. Those plants have been described as Ophrys apifera var. basiliensis. Anthocyanins also acts as a sun protection. They have the ability to absorb damaging light energy as UV UV radiation. The water-soluble anthocyanin pigments are in the vacuoles of the plant cell, which also contain water and nutrients. This protective function of the pigment is especially important for plants in Southern Europe. In general, the petals of flowering plants don’t have chlorophyll. 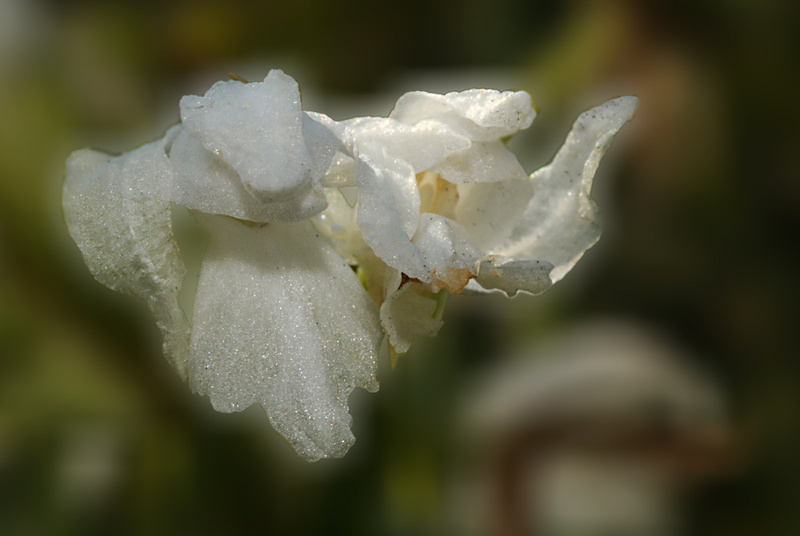 The tissue of their flowers and fruits don’t have chloroplasts (those cell parts which contain chlorophyll and therefore are green), but chromoplasts. Those don’t have chlorophyll, but for example carotenoids: yellow, orange or red color pigments. Only in the early bud stadium some flower plants still have some amounts of chloroplasts – later, those develop to chromoplasts or colorless leucoplasts with the function to store proteins or starch – this process has been explored in an interesting report by Kevin Pyke and Anton Page. The same transformation can be observed when tomatoes are ripening – the fruit is green at first, with many chloroplasts and chlorophyll, which later change to chromoplasts with the red lycopene pigment. The cells of green leaves have about 20 to 50 chloroplasts with chlorophyll. They are filled with stroma, which also contains the enzyme Ribulose-Bisphosphat-Carboxylase/Oxygenase (RuBisCo). Together with water and sun light, this enzyme has a decisive role in transforming carbon dioxide in glucose: from CO2 and H2O to C6H12O6. 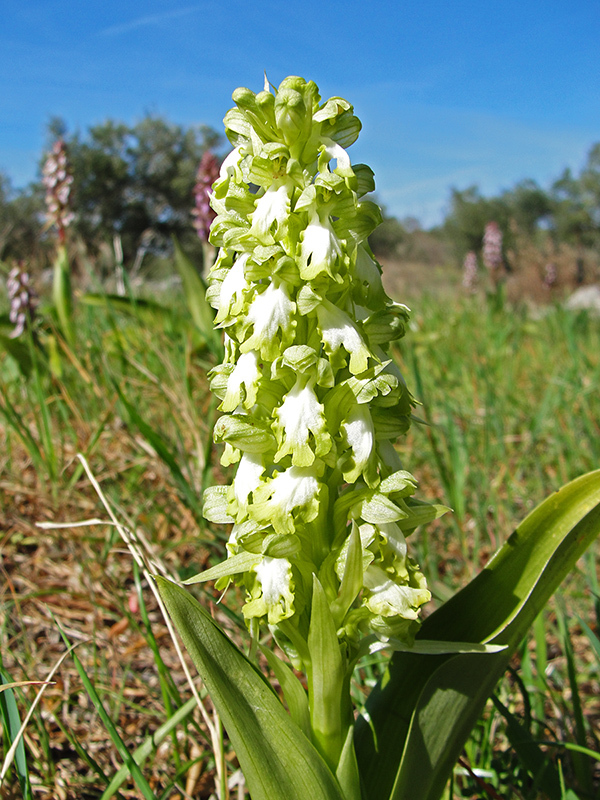 Studies have demonstrated that orchids of sunny meadows in the Mediterranean can be viewed as mycoheterotrophic: They get at least a part of their nutrients from fungi. 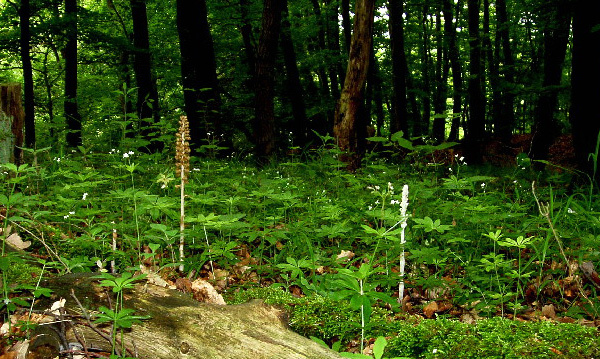 Since fungi can dissolve the nitrogen (which is important to produce enzymes) of the soil much better than higher developed plants, mycoheterotrophic orchids have a better nitrogen supply than other plants without this special relationship. The different orchid species have different relationships with fungi, but many orchids rely on fungi of the genus Tulasnella. 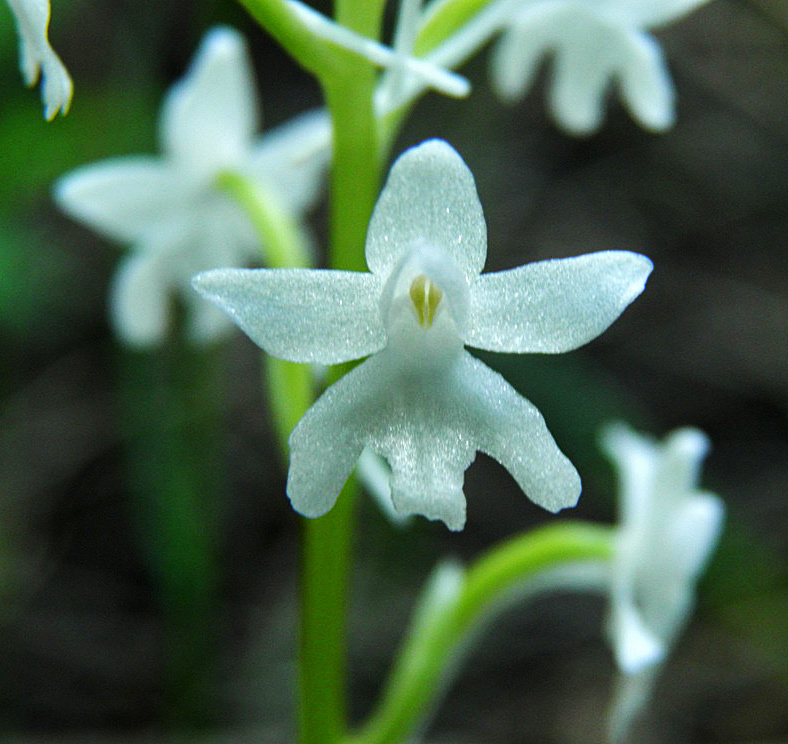 Additionally, Ophrys orchids make use of the fact, that they have chloroplasts in their flower tissue, so photosynthesis becomes possible in the flower. 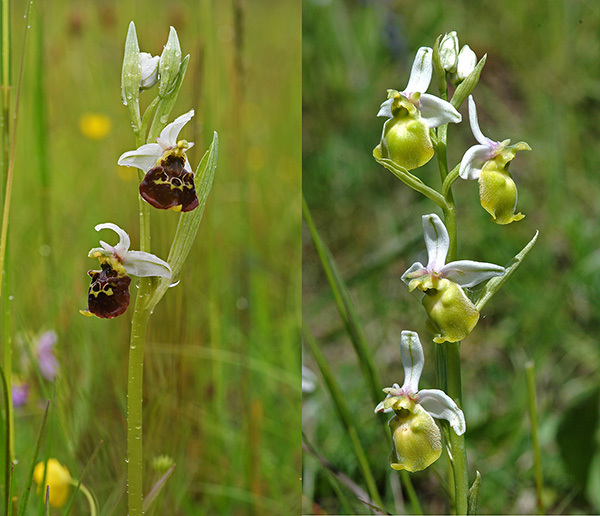 Some Ophrys species also have intense green petals – in contrast to the labellum there are no anthocyanins in these petals which would otherwise cover the chlorophyll. It can be assumed that Ophrys flowers make use of the Crassulacean Acid Metabolism (CAM). This mechanism of photosynthesis, named after the family of the Crassulaceae, is especially adapted to hot and dry places. The advantage of this CAM photosynthesis compared with the standard C3 photosynthesis: The plant cells receive carbon dioxide at night. Then, the stomata of the plant tissue are open. In the daily heat they can be closed, so the plant is protected from dehydration. 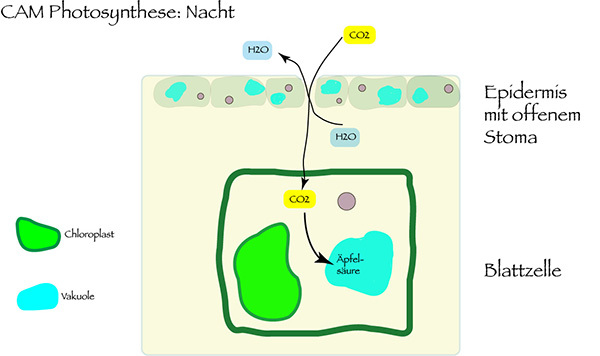 The CO2 received by night is stored in the vacuoles of the cell in form of malic acid. By day, it will be transformed to carbon dioxide and oxygen by the help of light energy. The CAM photosynthesis only needs less than a fifth of the water amount which is normally necessary in the case of C3 photosynthesis. Therefore, the plant can survive in dry times and is protected against lack of water. There are also plants with a facultative CAM photosynthesis: the water saving mode will only be used in dry summer times. In spring, the budding plants still use the C3 photosynthesis. While CAM has the advantage of a lesser water consumption it also has a big disadvantage: The production of biomass is quite lower. CAM plants grow much slower than C3 plants. 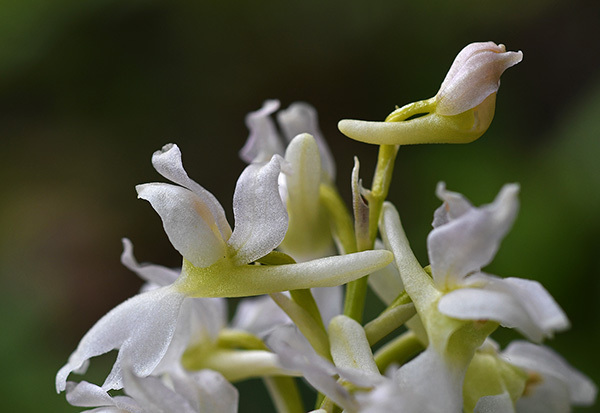 Most orchids with thin leaves use a C3 photosynthesis. 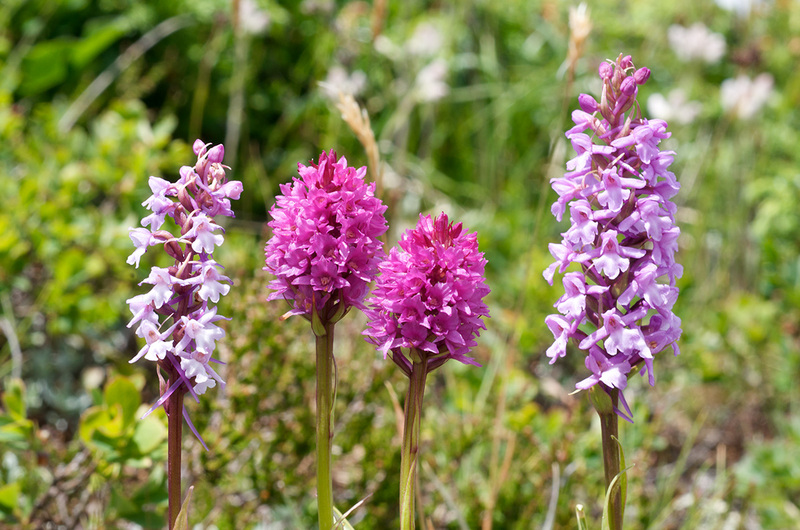 Among them are the genera Orchis, Dactylorhiza, Anacamptis and Neotinea. Those with thick leaves can master CAM photosynthesis, for example the tropical genera Phalaenopsis, Cymbidium or Cattleya. 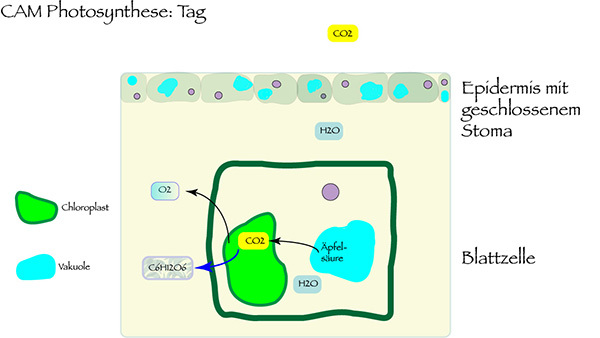 Since CAM plants have to store CO2 by night in order to enable the daily photosynthesis, they have enlarged vacuoles. Thick leaves can store more organic acid which conserves CO2 in night time. It may well be that this is also the case with the floral photosynthesis of Ophrys. One clear sign is the thick Ophrys labellum – the form which also has its special function to imitate female pollinators to induce pseudo copulation. The often low height of Ophrys is an additional sign that those species are at least facultative CAM plants, since there is less biomass produced. An advantage of the floral photosynthesis is the ideal position of flowers to the sun light. The higher amount of light energy absorbed enables a higher capacity to store CO2. Though there is no detailed research yet, there are many signs that especially the Mediterranean Ophrys master a floral photosynthesis. The CAM metabolism enables them to survive in dry climates, on rock grounds, with early withering leaves. The evolution of the Ophrys labellum fulfilled two functions: the adaption to pollinators and the ability of floral photosynthesis. The seedling is developing under conditions of a mycoheterotrophic supply with nutrients. Developing the first leaves, photosynthesis becomes possible. It can be assumed that the C3 mechanism of photosynthesis is still dominant, since temperatures are moderate in spring and there is enough water. 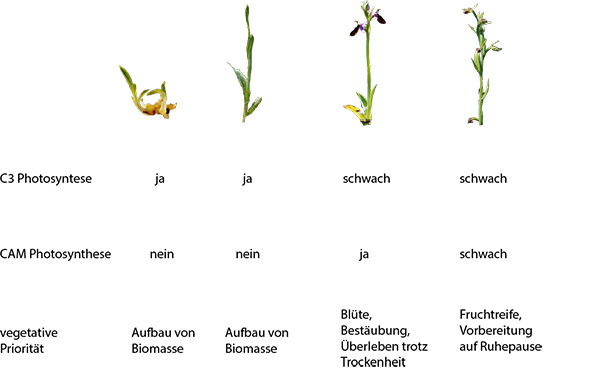 And the plant needs to grow quickly, to build up biomass. Here the C3 photosynthesis has a clear advantage. The budding plant is still growing, the leaves reach their optimal capacity for C3 photosynthesis. Beginning with flowering the leaves begin to wither. So the flower starts its additional CAM photosynthesis and secures a sufficient supply with nutrients even under conditions of increasing heat and drought. When the fruits ripe there is again a phase when biomass has to be added. But the capacity of photosynthesis is decreasing when the flower is withering. Now the role of the mycoheterotrophic supply with nutrients might become more important again. 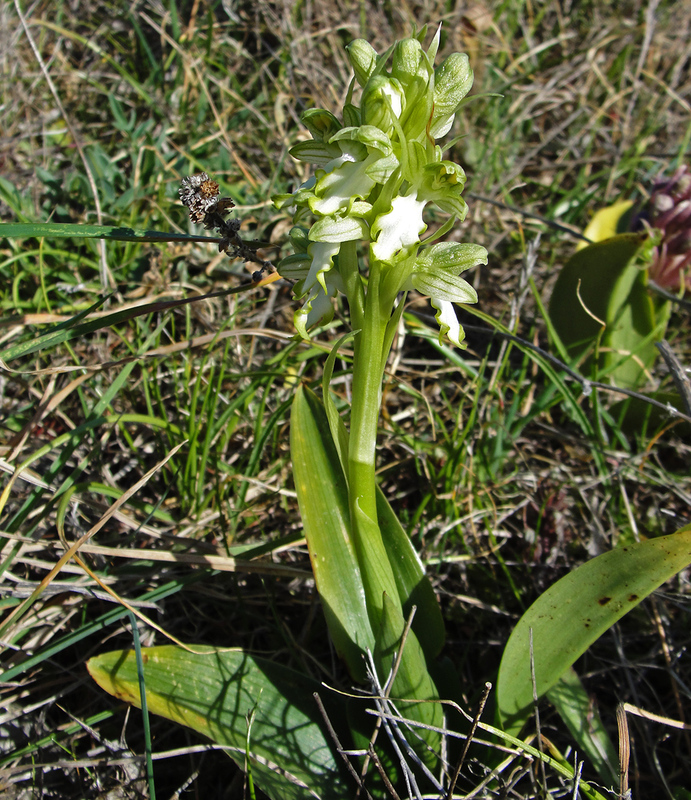 The first albiflora contribution of this spring is coming from Werner Hahn who has found and photographed this impressive Anacamptis collina in the Southern Spanish region Extremadura. Starting into 2015 I received a nice mail from Mirjana and Nebojša Jeričević living on the Dalmatian island of Korčula. They sent me photos of albiflora forms of five species, Orchis quadripunctata (above), Anacamptis pyramidalis, Himantoglossum robertianum, Dactylorhiza romana and Orchis italica. Especially interesting are those of Dactylorhiza romana. Those plants show some light yellowish hue but are not as yellow as the common yellow form of this bi-coloured species. They are are growing among violet forms and it might be assumed that they are plants whose flowers should have been violet but lost the anthocyanins pigments. 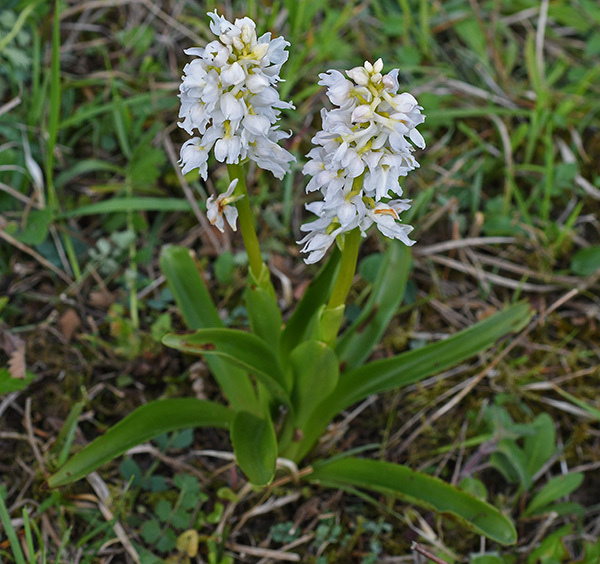 Though Dactylorhiza fuchsii is developing albiflora forms more often than other European orchids, especially in certain regions (Ireland, some German regions), there are no mentions of white-flowered Dactylorhiza saccifera. Both species are diploid and related with each other. Exploring the marsh areas of the Smolikas mountain in mid-June in Northern Greece, I’ve seen this splendid Dactylorhiza saccifera f. albiflora on wet grounds, in a height of 1200 m, embedded in Marsh Horsetails (Equisetum palustre) and accompanied by Dactylorhiza baumanniana and Neottia ovata. 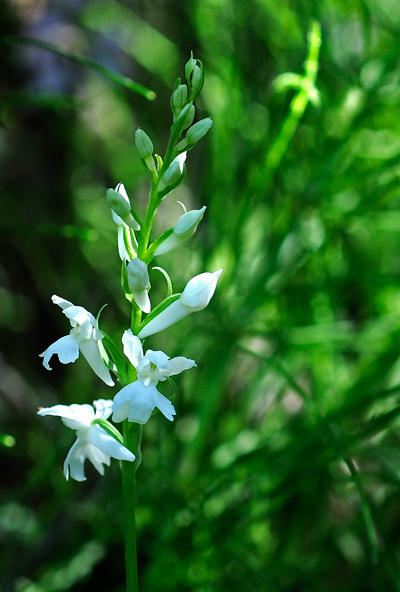 In the same area there was also a white-flowered Gymnadenia conopsea with a slight purple hue. Another highlight of the field trip to Northern Greece: three white-flowered Dactylorhiza cordigera on a clearing in the Vitsi mountain range near Kastoria. Those were surrounded by more than 1,000 cordigera plants with their characteristic deep purple colour.